Since the Year of the Signifying Frog, there have been reports of glimpses of an apparently ambulatory Hat in the vicinity of bars at Discworld Conventions. Many experts dismissed these claims as alcohol-induced fancies, but others speculated that there may have been a sentient creature inhabiting the hat. Following this hypothesis, Drs. Poundfeather and Burst conducted a series of experiments which involved leaving interesting books and plates of cheeses in darkened rooms, and were rewarded with the first confirmed sighting of the creature that would later become known as David. Through careful application of wines and ciders, the subject was taught the rudiments of human language, and subsequently graduated with honours from Unseen University. 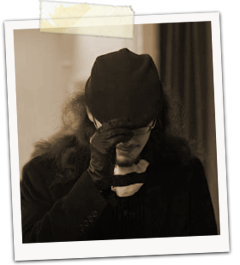 After being exhibited at seven assorted Discworld Conventions, David was enlisted by the Committee of IDWCon 2015 to do their design and graphics work; the success of which he continues to build on for this 2017 Con. An elusive and diffident creature, he can usually be found in dimly-lit corners, or quizzes, or both.